Why does sh IPR treat destination networks differently even though at first glance they should be treated the same? Referring to this diagram: Mah-670-1 and Mah-670-2 are routers serving as the gateway between a building and the larger campus network. Dug-agg-1 and Dug-agg-2 are the aggregation routers that connect them to the OSPF area (0.0.3.2) that they all belong to. Mah-670-1 has an OSPF P2P link with Dug-agg-1 and with Mah-670-2. Mah 670-2 has an OSPF P2P link with Dug-agg-2 and with Mah-670-1. Dug-agg1 and Dug-agg-2 have an OSPF P2P link to each other as well as P2P links to the larger campus network. All P2P and passive VLANs are in the same VR. While the 10.113 and 10.114 show only one route (through the agg)? Please note that both routes appear in the lsdb summary for each network. The LSDB tells the router about both paths to each network. can you show the complete LSAs for the affected networks, please? I cannot even see of what type each LSA is from your info. show ospf lsdb detail lsid 10.113.1.0[/code]I want to check if those are of different type, e.g. one type 3 and the other type 5. This is the nub of my question. OSPF seems to see 10.112.1.0 and 10.113.1.0 in the same way but show iproute treats them differently. (#) Preferred unicast and multicast route. (T) Matching RSVP-TE LSP, (u) Unicast, (U) Up, (3) L3VPN Route. Thus only 10.112.1.0/24 is known via two least cost paths that can be used for ECMP, the prefix 10.113.1.0/24 has but one least cost path, so no ECMP is possible. Since 10.113.1.0/24 and 10.114.1.0/24 are compressed (flag c), i.e. omitted from the FIB, because a less specific prefix including both 10.113.10/24 and 10.114.1.0/24 has the exact same next hop(s), prefix 10.112.1.0/24 seems to be the outlier here. Thanks for your time and energy on this. Quick guess - is ECMP enabled? Looks like different link metrics and for some reason both paths to 10.112.1.0 have ultimate metrics of 12. It would be easier to read and troubleshoot if you pointed some breader picture (where are the networks connected) and relevant config parts. EXOS shows all equal cost routes in the show iproute output, but if ECMP is not enabled, only one route is programmed into the FIB, as shown by the f flag. 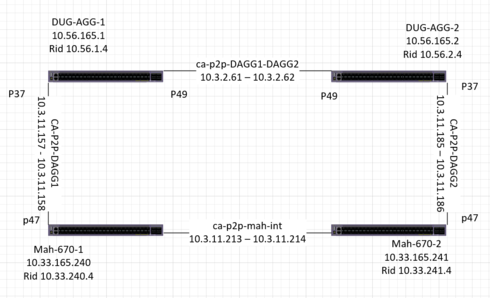 Since two routes to 10.112.1.0/24 are shown as installed into the FIB, ECMP is enabled. But it is a good observation that the routes towards 10.113.1.0/24 and 10.114.1.0/24 show a metric of 10, but the routes towards 10.112.1.0/24 show a metric of 12. @Timothy: Please provide additional information about the network topology. The diagram shows the two aggregtion routers at the top. These are the path back to the backbone. The two MAH routers at the bottom are the building routers for the Mahoney building. The Mahoney routers are the gateway (VRRP) routers for all of the VLANs active in the Mahoney building. The aggregation routers are the path out to all of the other buildings in area 0.0.3.2 and also to the backbone. The aggregation routers are the ABRs for the area. Several other buildings live in the same area. Each building has a router pair connected back to the aggregation routers in the same fashion as Mahoney. In our IP scheme the second octet is unique to a building. In the case of Mahoney 10.33.x.x are the VLANs in that building.